The Perth Demons took a while to warm up to Sarah Koehn ’13 as an athletic trainer, but before her Australian football internship was over, they wanted her to stay. “I kind of surprised them the first two weeks I was there,” Sarah said. “I found that apparently I have a hidden talent for massage. The boys started to seek me out to give them massages because I have a way of getting out the knots.” She is also good at strapping limbs. She also earned six credit hours so she will graduate in December. The athletic trainer she worked with Perth may even come to her graduation when she walks in May. 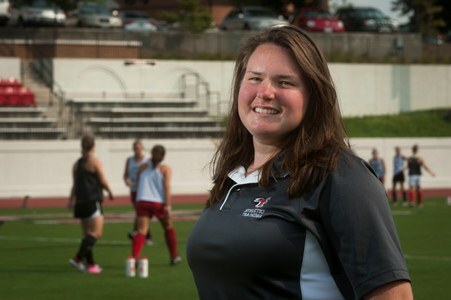 “LC’s athletic training program helped me so much because of all of the experiential learning they promote,” Sarah said. As an athletic trainer, she had to wear white so officials and players would know why she was on the field. Unlike American football, play does not stop with an injury. Sarah said she almost got run over once while attending to a footy player. Sarah worked with footy players in the afternoon, but also spent her morning working with Sports Medicine Australia, which allowed her to travel to high schools and a variety of sporting events to work with doctors, physiotherapists, exercise physiologists, and sports trainers. Sarah loved Australia so much she wants to go back. Whether she was petting kangaroos (“Kangaroos are like deer for us”), snorkeling along the Great Barrier Reef, or learning to throw boomerangs, she found a cruisy (cool) culture that made her feel at home. A native of Parkton, Maryland, Sarah said she had two LC Hall of Fame soccer-playing uncles — Jed Duggan and Mike Duggan — who got her interested in the College. Like many students drawn to athletic training, Sarah was injured a lot in high school playing sports. She channeled that interest into becoming an emergency medical technician (EMT) in Maryland and she also works with physical therapists when at home.